A body shape. My body shape. A pear shape is my body figure that can get really disproportionate at times. Add in my OL lifestyle and BOOM! Increasingly bigger, heavier bottoms! After trying the body contouring treatment, CoolSculpting, where the temperature is dropped in order to freeze my tummy fat cells to death, I’ve decided to try the other spectrum of non-invasive body contouring for another area of my body. 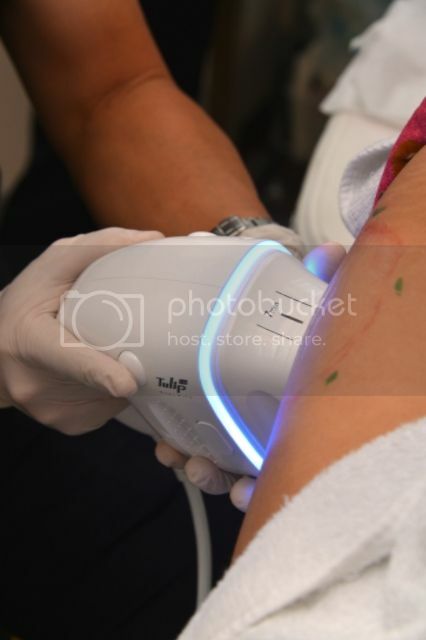 Dr Terence Tan from Halley Medical Aesthetics decided to use High Intensity Focused Ultrasound (HIFU) on my outer thighs, which uses the thermal or heating effect to ‘burn’ my fats to death. HIFU is a no downtime and non-invasive treatment that delivers energy at the optimal depth, temperature and precision necessary to permanently remove fat cells. It can also be used to lift and tighten skin – ideal for those who have early signs of cellulite! In short, HIFU works by using a focused beam of high intensity ultrasound energy to the desired region of fat beneath the skin to kill off the fat cells. This means it will not affect the surface of the skin. The body will then get rid of the damaged fat cells naturally, which means it will be gone forever! And just like CoolSculpting, it takes 2 to 3 months before results are gradually visible. In addition to fat reduction, Halley Medical Aesthetics also offers treatments that use HIFU to firm and tighten the skin by stimulating our collagen. Using focused ultrasound energy to travel deep down into our skin, it heats up the skin’s deep layer area where it is full of collagen to stimulate its production. No swelling, no downtime, no needles! The ultrasound energy targets the area without affecting the surface of the skin surface. Do you know HIFU can also be used to rejuvenate and firm your face and neck? For me, my HIFU treatment was targeted at the outer corners of my thighs and the entire session was over before I know it. But HIFU can also be done on the abdomen, inner and back of thighs, hips and arms. Dr Terence Tan first took some measures and drew on the areas that needed treatment. After the numbing cream was applied on my targeted area for 15 minutes, I reckon it took less than 15 minutes max for each thigh and the entire treatment was over?! During treatment, Dr Terence Tan used two different probes to target ultrasound energy at two different depths beneath my skin — one at 7mm and another at 13mm, both on each outer thigh. What’s the experience like? It was warm but bearable. Perhaps my threshold for pain has always been higher than average but it also helps that Dr Terence Tan was constantly checking on me if I was ok. So nothing over the limit but just enough to get its work done. I couldn’t believe how quick the session is and there’s really zero downtime. No numbness nor tingling sensation, everything was immediately back to normal… as though my treatment didn’t even happen to begin with. LOL. So far so good, what will the results be? Stay tuned to find out! Next Post Anna Sui Fall 2016: Mysterious Fairy Tale Collection!